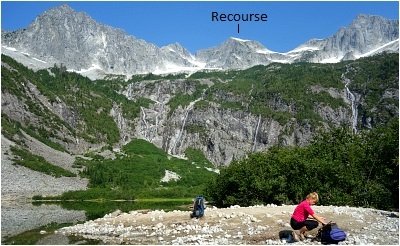 An outlier to a collection of crowded peaks ENE of Pemberton which include Cirque Peak and Cayoosh Mountain, Mount Marriott is a sprawling massif that also bears the distinction of being the highest in the Western Cayoosh Range. Just shy of the 9000-ft mark, Marriott is characterized by a long SE Ridge that offers a most pleasant ramble on granitic rock. The recently remodeled Wendy Thompson Hut, situated in the lake basin southeast of the peak makes for an ideal base from which to bag the peak, not to mention escape the swarming mosquitos.